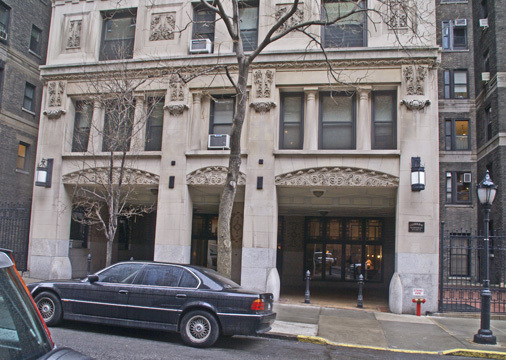 This 13-story cooperative apartment building has frontages on both West End Avenue and Broadway but its entrance is mid-block on 105th Street. 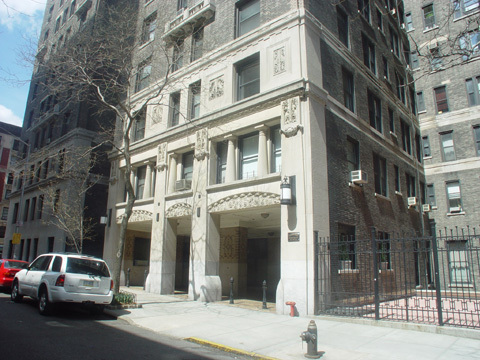 It was designed by Schwartz & Gross, the architectural firm that designed many of the best buildings on the Upper West Side. The building is most notable for its very fine carriage entrance. The 1997 restoration of Straus Park, at 106th Street and West End Avenue, according to an August 23, 1998 "Streetscapes" column by Christopher Gray in The New York Times, "came just at the start of the hoopla surrounding the Broadway musical and Hollywood movie based on the sinking of the Titanic." "The park wasn't part of the hoopla, but it could have been. Isidor and Ida Straus, to whom the park was dedicated in 1915, died together on the ship in 1912. The Strauses had a country home at 105th and West End; after they died the park was built, and their home was demolished and replaced by a blockwide apartment house. In the early 1800's, downtown New Yorkers built country houses on the Upper West Side, where the river views and breezes made the area a summer resort. The area had been fairly rural through the 1860's. One of the last rural houses went up in 1866, on what was later the northeast corner of 105th Street and West End Avenue - at the time most of the area's streets were delineated only on maps....The house was built by Matthew Brennan, a volunteer fireman who became a city official and allied himself with William M. (Boss) Tweed. In 1872 The New York Times, which had begun to expose the Tweed Ring in 1871, said that Brennan, then Sheriff, had collected $150,000 in fees for escorting 5,627 prisoners to prison, when in fact there had not been more than 340 prisoners. ''Who Would Not be a Sheriff?'' The Times headlined indignantly.Brennan soon became Tweed's jailer, and when a Tweed associate, Henry Genet, escaped, Brennan was sent to jail himself for a month for dereliction of duty. He returned to his house on 105th Street, and continuing difficulties brought on an attack of apoplexy. Although Brennan was supposed to have become rich, he had mortgaged his house, and his 1879 obituary in The New York Tribune said that ''he died a poor man.' The Brennan house went through several owners until 1884, when Isidor Straus bought it. Straus had been born in Bavaria in 1845 and came with his father, Lazarus, a peddler, to the United States in the 1850's. Around 1870 Isidor took over the china department of R. H. Macy & Company, becoming a partner in 1888. 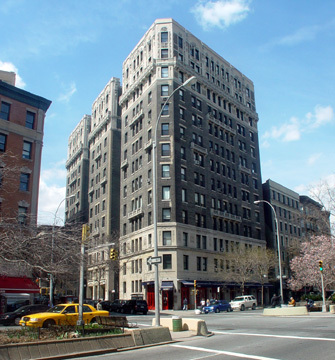 With his brother, Nathan, Isidor also created the Abraham & Straus department store in Brooklyn. When Isidor and Nathan became sole owners of Macy's in 1896 Nathan built a comfortable town house at 27 West 72d Street, then the most fashionable street on the West Side. But Isidor apparently felt comfortable in his 30-year-old building even though it looked odd surrounded by a new wave of brownstones and small apartment houses. Isidor was living in this house when he and Nathan conceived Macy's move from 14th Street and Sixth Avenue to 34th Street and Broadway, accomplished in 1902. In 1910 the census taker recorded Isidor Straus, 65, living in the house with his wife, Ida, 61, and their coachman, George Harris, 30. Isidor and Ida Straus were on the Titanic on April 14, 1912, when the ship hit the iceberg that sank it. Many passengers who survived saw Mrs. Straus, who was urged to take her place in a lifeboat, decline and rejoin her husband....on May 8 the 105th Street house was banked all the way around with floral pieces for Isidor Straus's funeral, followed by a public memorial service at Carnegie Hall. 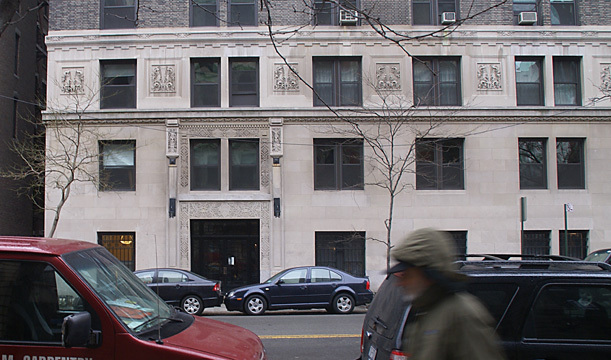 Ten days later the Straus family sold the property to Harry Schiff, a developer. 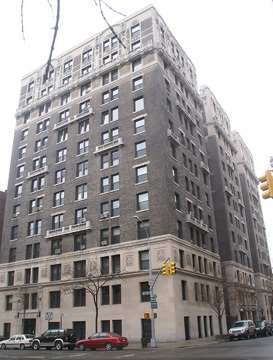 He finished the Clebourne apartment house, at 924 West End Avenue, on the site in September 1913. The Straus house had been one of the last of the country houses to survive. The peculiar trapezoidal shape and great breadth of 924 West End make it well known in the area. At the same time, plans for a memorial to Isidor and Ida Straus were moving ahead." "On April 15, 1915," the article continued, "Straus Park, the triangle bounded by Broadway, West End and 106th Street, was dedicated with one of the most evocative pieces of sculpture in the city. Designed by the architect Evarts Tracy and the sculptor Augustus Lukeman, the park was centered on ''Memory,'' a reclining female figure in bronze, eyes downcast into a triangular sheet of water. The figure rests on a slightly curved plinth of granite, with another, larger plinth in the rear forming a bench and inscribed with a biblical phrase from II Samuel: ''In their death they were not divided.'' The Times reported that the Straus family wept aloud during the tributes. Most memorial sculptures try to endow their subjects with grandeur; this one is exquisite in its understatement."